Just because Avonlea’s offices are on the Danforth, doesn’t mean our team doesn’t head to the city’s north end. Some of our biggest fans reside in North York and we’re constantly coming back to the area after their raving recommendations. From semi-detached family homes to the chic mansions along the 401, Avonlea Renovations has worked on them all. Our team is filled with experts on both small space re-design and reconstruction of bigger homes. That’s why North York residents call on Avonlea … because we have the versatility to handle a wide range of projects. Our showroom features a vast mix of the industry’s trendiest looks and more classic designs. And you can bet our team is excited to help you experiment with a wide combination of colours and textures. Avonlea clients know they will never get this kind of attention from the ‘Big Box’ stores. Our experts will sit down with you to assess your needs. After that, we’ll provide you with customized ideas and solutions based on your overall vision. Then we’ll get working to turn your home renovation dreams into a reality. 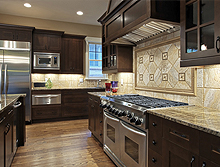 We’re known in North York for our successful kitchen and bathroom renovations. But that’s not all we do. Our repertoire also includes plumbing services and electrical contracting.